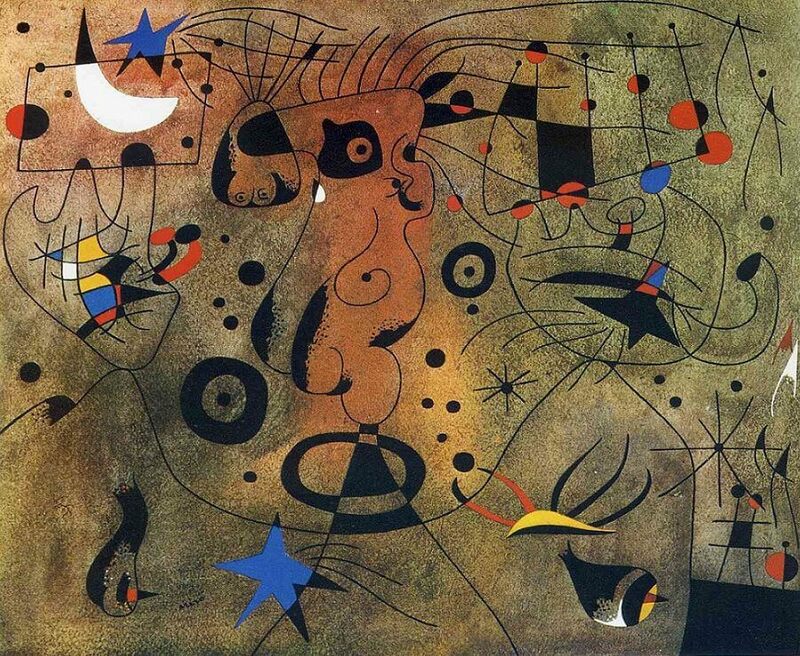 Bird, Insect, Constellation, one of Miro's late works - is dominated entirely by black. The horizontal division seems to suggest a landscape, but this impression is literally cancelled by two large black symbols in the top half, which unload a shower of black colour particles onto the entire field. The violence of this discharge is emphasized even further by an equally violent red dot on the left. Despite their vehemence, the symbols which thrust themselves forward into empty space are unambiguous enough to be recognized. There is a sickle, resting on the black ground and, crossing it, a symbol which is oval at one end, with two prong-like protruberances, of which the top one has an animal-like quality and looks as if it were going to jump. A further constellation in this picture, which otherwise derives its structure from the sprayed black particles, is formed by two black dots. These symbols crash down with brute force, and their violent impact is muted only by the black ground which provides a comforting counter-balance. These powerful symbols seem like warning signs in the sky, accompanying a bursting star, and the crescent-shaped symbol, which so strongly suggests a sickle, may well point to an eschatological interpretation.